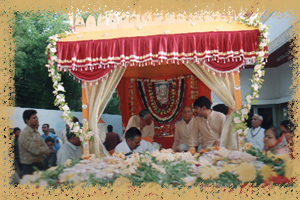 This is a unique temple tradion where a procession is organised by camp temple as part of the celebration. Shri Hanuman starts is day before his date of birth towards the temple of Vayudev (father of Hanuman) lacated at Vasana for receiving blessings from him. The chariot of Shri Hanuman is specially decorated in the procession starting from Shri Camp Hanuman. Hanuman is offered prayer together with music and lighting of the sacred lamp and then the procession starts from the temple. The devotees join the procession in trucks with musical band, on their own vehicles – including two-wheelers and follow the sacred chariot. The entire procession covers a lengthy route of 14 kilometers during which, the dedicated devotees welcome Lord Hanuman and procession at different places and distribute banana and sweet (bundi) among the volunteers and devotees as Prasad to those who joined the procession. With drums, musical band and cymbals, the group of devotional prayers continuously sings 'Hanuman Chalisa’. The total environment becomes devoted. Once the procession reaches at the temple of 'Shri Pavandev' the prayer is offered with music and sacred lamp to both the deities Shri Pavandev and Shri Hanuman. The deities then are offered with specially prepared 56 types of eatable varieties (Chhappanbhog). Then a collective dinner ('bhandaro') is organised for all the devotees. After completing the collective dinner the entire procession returns to Hanuman's own temple. In the campus of Hanuman Temple the birthday of Hanuman is celebrated with great gaiety and pomp. Lacs of devotees come forward to worship Shri Hanuman. On this auspicious day, over and above the routine activities, special offering of prayer with sacred lamp is conducted. Devotees offer 101 Kg. sweets to Shri Hanuman on this day. Then the same is distributed among devotees as 'Prasad'. Some devotes offer chocolates and balloons to be distributed among children. Then religious flag is hoisted ('dhaja rohan') at the camp temple by replacing old flag with the new one. This flag is specially prepared for Lord Hanuman. After hoisting the religious flag, a special dinner treat ('Bhandara') is arranged by temple authority for devotees. The devotees enjoy the same as a gift from Shri Hanuman ('prasad'). as favour from deity ('prasad'). There is special importance of worshipping Shri Hanuman on Kali Chaudas. On this day a special prayer with music and sacred lamp is arranged at Shri Camp Temple at 12.00 night. As gift from God in the form of soot and black thread; is distributed on this day among the devotees. Lacs of devotees begin their new year after worshipping Shri Hanuman. On this auspicious day the dressing of Shri Hanuman and decoration at the temple; is gorgeous and unique. 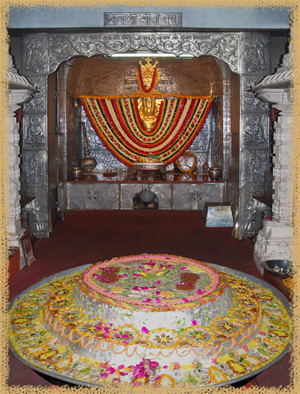 The temple is specially decorated on this day. On this day the devotees offer 56 types of special eatables to their loving God Shri Hanuman. Then the same is distributed among devotees as gift from God (Prasad). On this day a celebration is arranged at the temple by 'Punjabee' society. A special lunch is organised for the devotees. In the morning eatables like spicy product ('gota'), sweet (jalebi) and tea are served as snacks. Then after lunch; is offered to devotees.